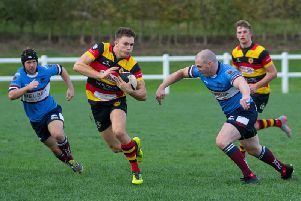 Despite making the North Premier Division trip to Blaydon with an injury-hit squad, Harrogate RUFC looked to be cruising to victory when they assumed a 36-21 lead midway through the second half. From this position of apparent strength, Dave Doherty's team did however conspire to lose the game as their hosts registered three late scores before, aided by the referee, they somehow withstood a last-gasp 'Gate onslaught. The visiting scrum dominated from the start on Blaydon's artificial pitch, forcing the home team to concede a string of penalties. When the Newcastle outfit were caught offside at a driving maul, Nathan Wyman’s kick opened the scoring and handed Harrogate a 3-0 lead. Some pacy Blaydon backs moves were then initially well contained until 'Gate conceded a penalty which led to an attacking line-out. From here, the ball was spread wide and stand-off Dan Taylor scored a fine try converted by Jamie Guy. A home clearance was then charged down, leading to an attacking line-out at the opposite end of the field. Andy Boyde powered forwards to set up a driving maul from which Sam Brady crashed over for a converted score that put the away side back in front. More Harrogate raids followed, but they lost possession in midfield and Taylor gathered the loose ball to sprint clear for another converted try, making the score 14-10 to Blaydon. 'Gate’s attacking game then forced the hosts' defence to go offside and an attacking line-out led to driving mauls and Brady’s second converted touchdown for 17-14 with two minutes of the opening period remaining. Doherty's men were not done yet, however, and James Dyson tidied loose ball inside the away 22 before skipper Danny Matthews’ clearance kick got his team back on the front foot. From an incisive backs move, Luke Edwards cut through to register a converted try and put Harrogate 24-14 up and in charge at the break. The second half opened with a spell of Blaydon pressure and the ball was recycled from a Taylor break for scrum-half Nathan Horsfall to grab a converted touchdown, narrowing the gap to just three points. 'Gate responded with a counter-attack from defence and Dyson hacked on to take play into the home half. Combined forwards and backs attacks stretched Blaydon’s defence to the limit and Boyde eventually crashed over out wide, though Wyman’s attempted conversion hit an upright. A dazzling Luke Riddell break led to the men from Rudding Lane's next score. His touchdown was adjudged to have been held up, so a five-metre scrum followed, at which Blaydon were penalised. The forward pressure continued, however, and Boyde’s converted try put the visitors 36-21 in front. As the hosts attempted to hit back, Boyde dispossessed a home player but was adjudged to have been offside and he was yellow-carded. Blaydon continued to attack and despite a Brady defensive technical offence, a converted try was scored. Controversially, Brady was then shown a yellow card and joined Boyde in the sin-bin. Harrogate’s weakened scrum managed to hold out against home pressure and the away 13 even launched a counter-attack from deep, but the numerical advantage eventually told. Centre Dan Marshall’s converted score trimmed the 'Gate advantage to just a single point, and then, with six minutes of normal time to play, another Blaydon foray forward led to another score, putting them 42-36 ahead. Restored to full-strength, Harrogate attacked strongly and looked certain to reclaim the lead at the death. Flanker Martin Dodds drove over to apparently score, but was penalised. Undeterred, repeated 'Gate drives led to Blaydon conceding penalty after penalty in the red zone, though no yellow cards were shown by referee Owen Taylor. In the final move of the match, Boyde powered over to clearly touch down, but unfortunately for the visitors, Mr Taylor was unsighted and a Blaydon hand got underneath the ball before he arrived at the scene, meaning the 'try' was not awarded and Doherty's troops were beaten. The Aces will aim to bounce back when they entertain Wilmslow at the Stratstone Stadium on October 13, 3pm kick-off.